In Mainz, board your Avalon Suite Ship® which is decorated and dressed up in Christmas colors, and embark on this festive Christmastime river cruise through the heart of Germany, ending in historical Nuremberg. Your European river cruise takes you behind medieval walls and towered gates to enjoy a guided walking tour in a picturesque village along the Main River. Celebrate the season in charming Würzburg, known as the “Pearl of the Romantic Road,” and surrounded by sloping hills covered with vineyards. Visit the ornate Bishop’s Residenz—home to the largest ceiling fresco ever painted, then stroll through the Christmas markets while you sip Glühwein (hot mulled wine). Continue your Christmastime river cruise to Bamberg, a UNESCO World Heritage Site, where the many nativity scenes exhibited throughout the town are sure to delight. Finally in Nuremberg, after your guided tour, you are free to visit the Christmas market—one of the most famous in the world. Wander through Old Town illuminated with holiday lights and decorations, and be sure to savor some traditional Lebkuchen (spicy gingerbread), a Nuremberg specialty. While on board, you’ll also learn how to bake a traditional cookie and hear all about German Christmas tra-ditions. 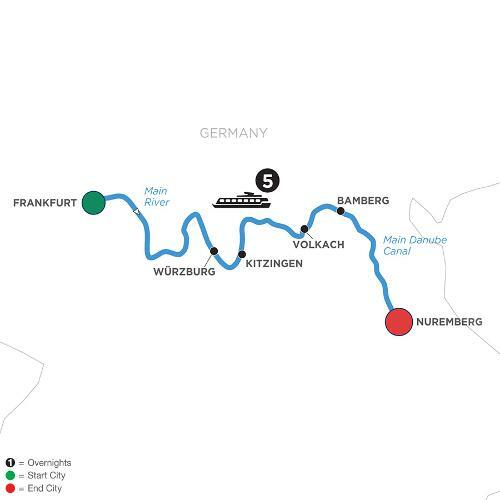 Historical treasures of Germany are perfectly paired with the views, sounds, and tastes of the joyous holiday season on this unforgettable European Christmas river cruise.